Greenpeace activist Faiza Oulahsen insists the protest in the Arctic was a peaceful and important one. RBTH: How have you been spending your time in St. Petersburg since you arrived? 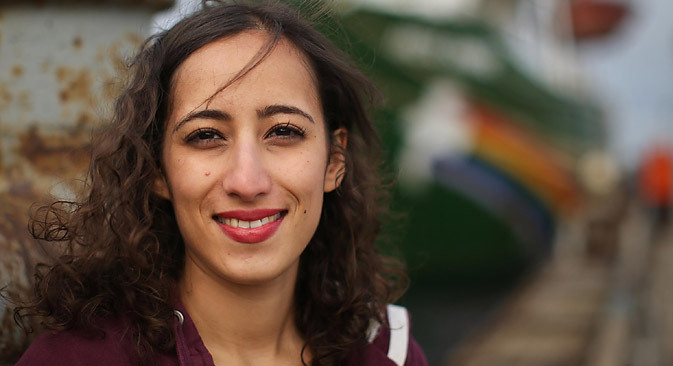 Faiza Oulahsen: Well, to be honest, I’ve been definitely enjoying my freedom, and to be honest it’s also a bit of a transition. I think that only people who have been in prison or in detention can understand that. So I’ve been trying to get back to a normal rhythm, eating healthy again; I’ve been calling, talking to my family. I’ve been calling with friends, and I’ve been walking around. I have to say the center of St. Petersburg is beautiful. RBTH: How many times have you been to Russia before? F.O. : Well this is my second time – my first time was half a year ago, in Khanty-Mansiisk. We were looking at oil spills. Visiting oil spills and basically scouting for oil spills, and after that we invited some journalists in the hope that they would report on that and bring the story out. Because sometimes you have to be there where it actually happens. RBTH: Do you consider that Greenpeace’s action was a peaceful protest? F.O. : I don’t think – well, obviously, if we’re being accused of hooliganism and, you know, that’s being spread out, but it’s a distorted view of what really happened there. But so far there has been no proof of anything that comes close to hooliganism or piracy, and it was a peaceful and non-violent protest, and also, if we do those protests, I mean, it happens with activists that know what they’re doing, and safety is always a priority. You always do that by communicating, by telling the company what you’re here to do. RBTH: Did any of you anticipate that making your protest would result in your vessel being detained? F.O. : Well, in the weeks before, because the expedition was longer than just the moment we were there, they did threaten [us] with boarding the ship, and at some point they did force us, under the threat of violence, to [let them] board the ship. But we just kept thinking, “Ok, you know, this is just a way to get us out of there, and they know we’re harmless and we’re just there to peacefully protest.” That doesn’t mean that we don’t think about all possible scenarios, whether they’re likely or not. For us, and also for myself personally, it definitely was a possibility ending up in jail; however I thought it would be a very unlikely scenario. RBTH: Being detained and incarcerated is clearly not a positive experience, but besides that, what impression have you had of Russia since you’ve been here? F.O. : Well, I had the impression the first time I came to Russia [that] anything is possible in this country. I think that feeds the uncertainty that can give you hope but that can also create fear, be the cause of fear. I remember one person wrote to me: “Living in Russia is like a lottery, anything can happen.” And that is true. It’s like the most absurd things can happen in this country. And I think that’s also the thing that fascinates me. At the same time, I meet so many kind Russians that are very sincere in their support and their worries about me and the others of the Arctic 30. They’re incredibly kind, even though perhaps for a foreigner it doesn’t seem like it the first time you meet a Russian. I can also remember some Russians in court – even in court, even like the translators – saying to me, “Don’t be sad, you are so brave; it’s so brave what you have done.” I have had very many supportive reactions from Russians that do care what’s happening to their country, that love nature, that go pick cranberries like people do in Khanty-Mansiisk, that live off nature. RBTH: Are you aware that the majority of Russians think that the seizure of your vessel was legal? How do you feel about that? F.O. : Well, I don’t know if that’s the case, if many Russians think that. I spent two months in prison, and I barely had any news, I don’t know. But what I do know is that many of the Russians I spoke [with] are very supportive, are ashamed of what is happening to us, know that our intentions were noble, and that we were doing it in a peaceful way, a non-violent way. RBTH: In the light of this experience and everything that has happened on this particular protest, would you be prepared to participate in similar protests in the future? F.O. : Well, I will continue to campaign to save the Arctic, that’s not going to change. So yes, I’ll continue to take part and be part of future protests. However, I have to admit, I do think tactics in the future in Russia are going to be slightly different, and we’re going to have to be more creative. But I will continue to campaign, whether it’s protesting against Shell drilling in Alaska, Statoil in Norway, or companies like Rosneft and Gazprom in the Russian Arctic. RBTH: In your view, of all the environmental risks associated with drilling in the Arctic, what would you say is the most serious? F.O. : Well, drilling for oil is never without risk. So you have a significant difference between onshore oil and offshore. And, well, with offshore the risks are always significantly greater. And there’s always a risk of an oil spill, no matter how small it is. There’s a lack of infrastructure, so the chances that something would go wrong are significantly greater, and if it goes wrong, well… if you just make the comparison to Gulf of Mexico BP: So, warm waters – ok, yes, it was deep sea drilling, but warmer waters – quite impressive infrastructure, and it still took them two to three months to stop it. So in theory, there is actually a possibility that when you have an oil spill at Prirazlomnaya, it might go on for a year.